The iFoster TAY Assistant with an integrated Digital Locker is an online personal assistant that helps current or former foster, kinship or crossover youth manage their lives. Youth can store documents, find resources, apply for programs, and keep track of it all so they are in control of what they need to get ahead. Youth can share their accomplishments with iFoster so we can cheer them on and congratulate them on their successes. Monthly, iFoster will send congratulatory cards and gifts from our corporate partners to encourage our Youth to excel. Sign up for iFoster as a Transition-Age Youth and get your own personalized Account. It's FREE! Once approved, you will get your own My Account with access to Resources selected to meet your needs and eligibility. 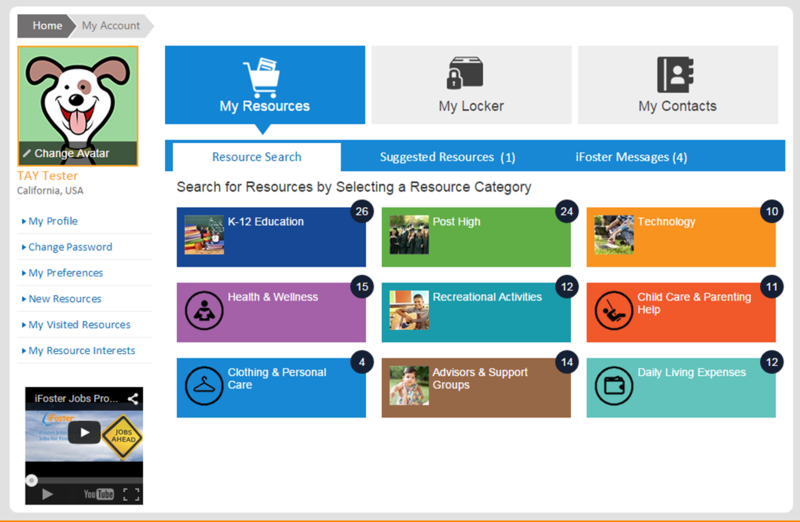 Choose from resources that can help you with school, get a job, daily living expenses, and so much more! Use your own secure, data encrypted iFoster Digitial Locker to store and keep track of important documents so they can always be accessed from anywhere, anytime. And reach iFoster's Member Specialists directly to get help with anything you need. You're transitioning to independence, but that doesn't mean you need to do it alone! Let iFoster help you! Welcome to your personal, digital assistant. Share your accomplishments with iFoster and let us celebrate you! Every month, iFoster will reward and recognize achievements with congratulatory cards and gifts from our corporate partners. You need to be an iFoster Member to share a success. Youth share your own. Caregivers and Workers can share on behalf of their Children and Youth.